A new research report by Persistence Market Research has all the features that makes it a complete guide to the global vitamin supplements market. The report is titled ‘Vitamin Supplements Market: Global Industry Analysis (2012-2016) and Forecast (2017-2025)’ which gives an accurate analysis of the market for the forecast period of 2017-2025. This comprehensive research report consists of key drivers of the market that are driving the growth, includes restraints that are limiting the global market’s growth, various trends that are following the market and also the opportunities available in the future for businesses that deal with global vitamin supplements market. To give a systematic analysis of every part of the market, we have segmented the market into various segments, divided on the basis of different parameters. This segmentation helps to analyze different sectors of the market individually and come to an accurate result. The report also includes the global vitamin supplements market’s price analysis and a comparative year to year growth statics. The research study can be of great help to the key marketers as well as the entrants to understand the market scenario, strategize their business plan accordingly and also grab the opportunities present in the market with a view to achieve maximum hold in the market. The research report by Persistence Market Research on global vitamin supplements market is an initiative to give the readers an insight to a complex looking market. The research process involves an aggressive research by a huge team of analysts and industry experts. The research methodology involves an in-depth secondary research at first, which helps to determine top industry players, products, applications, market size etc. At the same time, primary research is conducted in which a number of interviews with various industry experts and subject matter experts is gleaned. Information is also gathered from annual reports of companies, company websites, white papers etc. All the data collected is then validated at different levels to assure the accuracy of the end result. The credibility of the research study lies in the higher accuracy of the data that goes to a near 100 percent. Once the research process is over, the collected market statistics are presented in a systematic manner to help readers understand it with convenience. The research report starts with the executive summary of the outcomes, including the market CAGR during the forecast period, the major drivers of the market and the basic definition of the market along with research scope. It is followed by the segmentation and analysis based on individual segment. Further the report gives the forecast for the market and then key drivers, restraints and opportunities. One major pointer covered by the report is competitive landscape. This section in the research report briefs about the profiles of major players in the market along with their individual SWOT analysis, key product portfolio, developments, financials and geographical spread. Company profiling can assist the reader in slating key strategies to gain competitive advantage in the years to follow. The increase in awareness among people related to the vitamin supplements, has resulted in favorable market condition for global vitamin supplements market. There are various factors that are helping the growth of various vitamin supplement products. The increase in awareness has made people more health conscious. They are also concerned about the increasing health costs. Many vitamins can cure various problems, for instance, Vitamin C can improve immune system, Vitamin D strengthens the bones, and vitamin A improves the vision and so on. Such benefits of various vitamins is shifting public interest towards consumption of vitamins and include them in their diet in order to prevent all their health problems. Aging population and people with small kids are also preferring such dietary supplements. Geriatric population are using vitamin supplements as to avoid the disorders related to their aging, whereas, the kids are given vitamin supplements in the form of gummy candies. Since 2013, the gummy form of vitamin supplement has seen a double digit growth in its sales. The research report by Persistence Market Research bifurcates the market into various segments among which multi vitamin segment proved to be a lucrative market segment with a great future prospects. This segment accounts for a significant revenue share in the global vitamin supplements market with multiple product variants coming up in the market. Industries are also focused on improving the specificity of these products. This segment is likely to account for a higher value share during the forecast period. According to the forecast, multi vitamin segment as the dominant segment with a projected market value of over US$ 23,400 Mn in 2017 which is expected to reach a value of over US$ 37,900 Mn by the end of 2025. However, the Vitamin D segment is expected to grow at a comparatively higher pace to register a stellar CAGR during the period of assessment. The vitamin D segment is projected to show the highest year to year growth with a robust CAGR of around 10.7%. 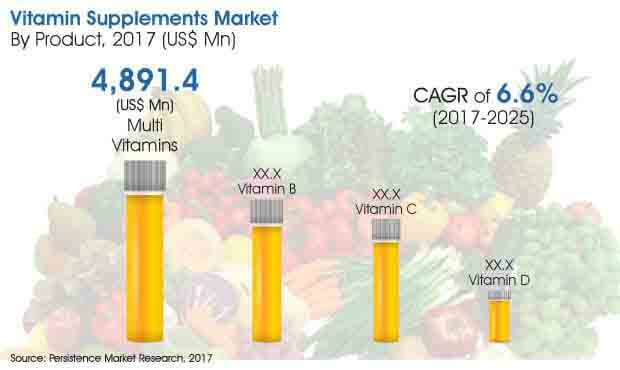 The global vitamin supplements market is anticipated to be over US$ 48,500 mn in 2017 and reach over US$ 81,000 Mn by the end of 2025 soaring at a CAGR of 6.6% throughout the period of forecast, 2017-2025. The rise in vitamin supplements market in Asia Pacific is the highest with the rise in its urban population. The development in the emerging economies in Asia Pacific, especially China and India are more than willing to embrace healthy diet including use of vitamin supplements, keeping in mind the end goal to meet their nutritious necessities. Asia Pacific is considered as one of the fastest developing markets for vitamin supplements because of the developing urban populace and expanding extra cash. Moreover, several major players have entered Asia Pacific with a view to fulfil the growing requirements of vitamin supplements in this region. In this region also, the multi vitamin products are the most popular ones in the market with maximum market share and vitamin D shows the highest growth to reflect a CAGR of 11.2% during the assessment period.